Many cities across the US have reported the same findings: protected bike lanes help reduce crashes and protect cyclists, while also improving feelings of safety and wellbeing. In addition, they reduce motor vehicle speeds and increase the number of cyclists who bike on roadways. In fact, protected bike lanes have been found to reduce the risk of injury by an impressive 90%. This study comes from researchers at the University of British Columbia who found that protected bike lanes make a huge difference to cyclist safety. The study was published in the American Journal of Public Health. It involved examining the scenarios surrounding 690 injured cyclists that ended up in emergency rooms in Toronto and Vancouver over a six-month period between 2008 and 2009. Researchers conducted interviews with cyclists and then plotted on a map the exact route each cyclist was on at the time of their accident. The injury site along with a randomly-selected control site was defined as one of 14 unique street types. The goal was to determine the safety of each ‘type’ of street. What Are the Least & Most Safe Streets? Some of the factors highlighted above were found to increase injury by around 200%. Even better, streets with protected bike lanes reduced injuries by an impressive 90%. Off street trails and multi-use paths reserved for cyclists, pedestrians, skaters, and other non-motorized forms of transportation reduced accident rates by around 60%. In the 1970s, activist John Forester promoted the ideology of vehicular cycling – or rather creating roadways where cars and bikes acted like equals. It was believed that if cyclists and motorists acted like one in the same, everyone would be safer. It turns out this school of thought is far from correct. Unfortunately, people who bought into this idea protested against protected bike lanes for many years. And it worked, many American cities went without bike infrastructure for many years, and this ideology held a lot of pull with engineering guides. Luckily, the ideology has vastly shifted, and more cities are implementing protected bike lanes and other types of bike infrastructure. As a result, cyclists are staying safer and accident rates are decreasing. You can no longer argue against bike lanes and the importance they hold for protecting cyclists. They promote more people to ride bikes and even reduce vehicle speeds. Yet, to this day, the “Green Book,” often referred to as the ‘bible of transportation engineering,’ still views protected bike lanes as “experimental.” With so much research coming out in proof of the added safety they provide, we know this will soon change. NACTO released an analysis that showed bike lanes reduce risk of injury across seven U.S. cities. In past years, we’ve done more to help improve the safety of cyclists, which includes adding more protective barriers. In proof of the effectiveness of this, cycling fatalities decreased by 21% from 1998 to 2008. A hybrid electric vehicle is 57% more likely to be involved in a crash with a cyclist compared to a standard vehicle. That’s largely because cyclists do not hear the hybrid vehicle approaching. In Minneapolis, two streets were renovated to feature bike safety features. As a result, a 47% increase in bike traffic was reported, and at the same time, total number of vehicle crashes went down. In addition, traffic became more efficient, and parking revenues were unaffected. Automobile safety improvements are important, but interestingly enough, bicycle safety improvements provide greater benefits to more people – increasing safety results by around 10%. The majority of bike crashes occur on major streets that lack bike facilities, followed by minor streets that lack facilities, such as bike lanes and bike paths. Cities that promote cycling and have higher numbers of active cyclists tend to show lower percentages of crashes across the board. That means bike-friendly cities are safer for all of us. At TerraCast, we offer a host of products that can be used to create protected bike lanes that improve cyclist safety. We offer durable bollards equipped with lighting fixtures. Plus, we offer heavy-duty planters that can offer a stylish approach to protecting bike lanes across the nation. 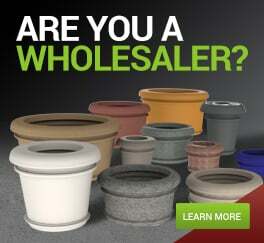 We welcome you to shop our collection of bollards, and our collection of planters. Experience first-hand the difference of high-quality products made here in the USA. See why so many cities in the US count on our products above all else.